2Departamento de Fitossanidade, Engenharia Rural e Solos, Universidade Estadual Paulista (UN ESP). Sao Paulo (Brasil). Received for publication: 23 July, 2011. Accepted for publication: 29 June, 2012. Stem canker and black scurf diseases of potatoes are caused by the basidiomycetous fungus Thanatephorus cucumeris (anamorphic species complex Rhizoctonia solani). These diseases have worldwide distribution wherever potato is grown but their etiology varies depending on the predominance of distinct R. solani anastomosis groups (AG s) in a particular area. Within the species complex, several AG s have been associated with stem canker or black scurf diseases, including AG -1, AG -2-1, AG -2-2, AG -3, AG -4, AG -5 and AG -9. This article reports on the most comprehensive population-based study, providing evidence on the distribution of R. solani AG s in Colombian potato fields. A total of 433 isolates were sampled from the main potato cropping areas in Colombia from 2005 to 2009. Isolates were assigned to AG s by conventional PCR assays using specific primers for AG -3, sequencing of the ITS -rDNA and hyphal interactions. Most of the isolates evaluated were assigned to AG -3PT (88.45%), and a few to AG -2-1 (2.54%). The remaining isolates were binucleate Rhizoctonia (AG -A, E, and I). Pathogenicity tests on the stems and roots of different plant species, including the potato, showed that AG -3PT affects the stems of solanaceous plants. In other plant species, damage was severe in the roots, but not the stems. AG -2-1 caused stem canker of Solanum tuberosum cv. Capiro and in R. raphanistrumi and B.campestris subsp. Rapa plantlets and root rot in other plants. The results of our study indicated that R. solani AG -3PT was the principal pathogen associated with potato stem canker and black scurf diseases of potatoes in Colombia. Key words: black scurf diagnosis, molecular techniques, soilborne fungi. El chancro del tallo y la sarna negra de la papa son ocasionados por el hongo basidiomicete Thanatephorus cucumeris (especie anamórfica compleja Rhizoctonia solani). Estas dos enfermedades tienen una distribución global en los cultivos de papa, pero su etiología local es variable, dependiendo de la predominancia de diferentes grupos de anastomosis (GA s) en una localidad dada. Al interior de esta especie compleja se han encontrado varios GA s asociados con el chancro del tallo y la sarna negra, como GA -1, GA -2-1, GA -2-2, GA -3, GA -4, GA -5 y GA -9. Este artículo presenta el estudio más exhaustivo a nivel poblacional realizado en Colombia sobre la distribución de los GA s de R. solani en lotes comerciales de papa. Se examinaron 433 aislamientos colectados entre 2005 y 2009 en las regiones paperas más importantes del país. Los aislamientos fueron asignados a los GA s por PCR usando cebadores específicos para el GA -3 y secuenciamiento del ITS -ADNr e interacciones hifales. El GA -3PT cubrió la mayoría de los aislamientos (88.45%), el GA -2-1 tuvo el 2.54% y los aislamientos restantes correspondieron a cepas binucleadas de R. solani (GA -A, -E, y -I). Las pruebas de patogenicidad sobre diferentes especies de plantas, incluida la papa, evidenciaron que el GA -3PT afecta los tallos de las plantas de la familia Solanácea; en otros hospedantes evaluados el daño fue severo en las raíces pero no en los tallos; el GA -2-1 ocasionó chancros en tallos de plántulas de Solanum tuberosum cv. Capiro y R. raphanistrumi and B. campestris subsp. Rapa, y pudrición de raíces en otras plantas. Los resultados de nuestro estudio indican que el GA -3PT de R. solani es el principal patógeno asociado con las enfermedades del chancro del tallo y la sarna negra de la papa en Colombia. Palabras clave: diagnóstico de la sarna negra, técnicas moleculares, hongos del suelo. Rhizoctonia solani Kühn [teleomorph Thanatephorus cucumeris (Frank) Donk] is a destructive soilborne pathogen that causes diseases in many plant species world-wide (Ogoshi, 1996). Symptoms associated with R. solani are diverse, including damping-off, root rot, stem canker, crown rot and blights (Anderson and Stretton, 1982; Ogoshi, 1996). Rhizoctonia species have been traditionally identified based on the cell nuclear condition (multinucleate, binucleate and uninucleated strains). R. solani is a species complex consisting of several distinct Anastomosis Groups (AG s) that vary in hyphal anastomosis ability, host range, symptoms in different hosts, geographical distribution, biochemical patterns, fatty acids composition and nuclear DNA sequence (Anderson and Stretton, 1982; Ogoshi, 1987; Carling, 1996; Cubeta and Vilgalys, 1997). AG s have been proposed to represent an independent evolutionary unit or phylospecies within the R. solani species complex (González et al., 2006). Traditionally, AG s have been identified based on the ability of fungal hyphae to anastomose with tester isolates of designated AG s (Carling, 1996; Sneh et al., 1998; McCabe et al., 1999). The methodology for AG -grouping based on microscopical somatic interactions is time consuming and its implementation requires experience (Lees et al., 2002). Alternative methodologies have been developed to improve AG identification with large-scale population-based sampling. Currently, sequence analyses of ribosomal DNA (rDNA ) regions are used as a simple and reliable methodology for the accurate molecular systematics of Rhizoctonia species and their anastomosis groups (Kuninaga et al., 1997; Sharon et al., 2006; Sharon et al., 2008). Currently, 14 AG s have been described and named AG -1 through AG -13 and AG -BI (Carling et al., 2002; Truter and Wehner, 2004; Sharon et al., 2008). The first AG s described (AG -1, -2, -3 and -4) were associated with the most destructive Rhizoctonia diseases around the world, whereas those described later are regarded as less destructive pathogens and have more restricted geographical distribution (Carling et al., 2002). The majority of potato (Solanum tuberosum L.)-infecting R. solani isolates described worldwide belong to AG -3 subgroup PT (AG -3PT), although AG -1, AG -2-1, AG -2-2, AG -4, AG -5 AG -7 and AG -9 have also been associated with disease symptoms on potato stems, stolons, roots and tubers in several other places around the world (Anguiz and Martin, 1989; Bains and Bisht, 1995; Balali et al., 1995; Virgen-Calleros et al., 2000; Campion et al., 2003; Truter and Wehner, 2004; Rosa et al., 2005; Woodhall et al., 2007; Tsror, 2010; Cedeño et al., 2001). The main diseases caused by AG -3PT of potatoes are black scurf on tubers and stem canker. These two diseases are economically important, occurring in potato production areas throughout the world (Banville et al., 1996; Jeger et al., 1996; Banville and Carling, 2001). R. solani is mainly disseminated via contaminated tubers. Once the fungus is established in a particular area, inoculum builds up with consecutive seasons of potato monoculture (Tsror and Peretz-Alon, 2005; Tsror, 2010). R. solani can cause both quantitative and qualitative damage to potato crops. Quantitative losses are due to stem, stolon and root infections, which affect tuber size and number. Qualitative losses are mainly due to deformed and cracked tubers and to the development of sclerotia on the tuber surface (Banville, 1989; Carling et al., 1989; Hartill, 1989; Scholte, 1989; Platt et al., 1993; Jeger et al., 1996; Tsror, 2010). Initial infection of sprouts prior to emergence causes lesions and may be lethal to sprouts or sprout tips. However, the emergence of new compensatory sprouts may result in no significant crop damage (Lehtonen et al., 2008). In Colombia, the potato is grown in the Andean highlands (2,500-3,200 m a.s.l.). The departments with the largest production areas are Cundinamarca, Boyaca, Nariño and Antioquia. They contribute 70% of the national potato production (Espinal et al., 2006). Seed production is mainly domestic. Although some potato growers use certified tuber seed, it is impossible to guarantee R. solani-free tubers mainly because current Colombian regulations for seed potato production allow up to 10% sclerotia-infected tubers (ICA, 2003). In consequence, the pathogen is easily dispersed between regions on infested seed tubers. Research on Rhizoctonia diseases associated with potatoes in Colombia has focused on biological control strategies (Bautista et al., 2007; Beltrán et al., 2007). Knowledge about the disease biology and the relative importance of the various AG s on the etiology of Rhizoctonia diseases in potatoes is still scarce. Since farmers, in general, are not aware of the underground symptoms on potato stems, there are no estimates of the importance of the Rhizoctonia diseases on tuber quality and yield. The main goal of this research was to determine the etiology of Rhizoctonia diseases of potatoes based on a large-scale population sampling in Colombia. Previous studies have shown that AG s other than AG -3 PT may occur in lower proportion in potato fields around the world. The specific objectives of this study were (i) to identify and characterize the relative importance of the distinct R. solani AG s associated with potato stem canker and black scurf diseases in Colombia using both a PCR-based method and the classical somatic compatibility interactions for AG -grouping; and (ii) to determine the pathogenicity of each AG in potato and other plant species. 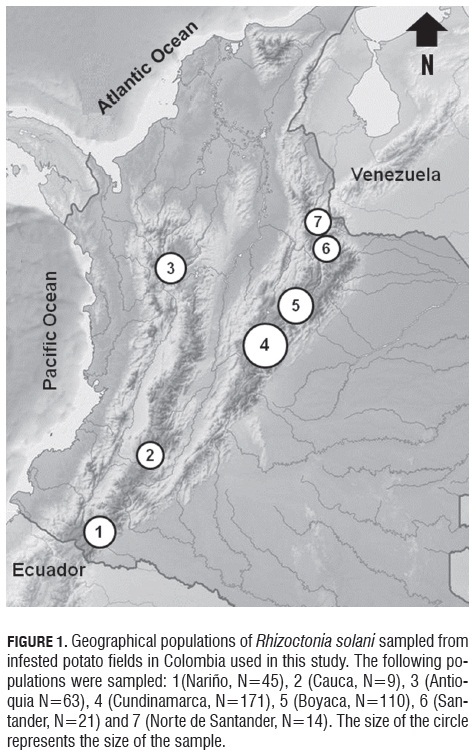 Stem canker-diseased early-sprouting potato plants were sampled from six to eight transects within fields from six distinct fields in Cundinamarca, four in Boyaca, two in Nariño, Antioquia and Santander, and one in Cauca and Norte de Santander (Fig.1, Tab.1). These fields were located across the Colombian Andes and represent the most important potato cropping areas in Colombia (Espinal et al., 2006). These samples were brought to the Laboratorio de Biotecnología Antonio Angarita Zerda (LBAA Z) of the Facultad de Agronomía at the Universidad Nacional de Colombia. The plants were washed in tap water and infected stem segments were plated on a modified selective medium for R. solani (Ko and Hora, 1979), modified by Castro et al. (1988). Samples were incubated at room temperature (20°C) in the dark. Whenever possible, seed tubers were also collected with the purpose of isolating the fungus from sclerotia. After 24 to 48 h, pure cultures of R. solani were established by transferring hyphal tips from the growing colonies on the selective medium onto potato dextrose agar medium (PDA, Oxoid). Mycelium for genomic DNA extraction from 433 isolates was obtained from 5-d-old cultures on PDA containing a sterile cellophane sheet. After incubation at room temperature, mycelium from each isolate was harvested by scraping the mycelia from the cellophane membrane, followed by freezing and lyophilization. DNA was extracted with a QIAGEN® DNeasy Plant Mini-Kit. The anastomosis group was determined by selective amplification of the ribosomal DNA (rDNA ) region using specific primers for R. solani AG-3 (Lees et al., 2002). Isolates from Cundinamarca, Antioquia and Nariño were processed at the Institute of Integrative Biology, ETH Zurich. Polymerase chain reactions (PCR) were carried out in 10 µl volumes containing 10-50 ng of genomic DNA , 10 mM of KCl, 10 mM of (NH4)2SO4, 20 mM of Tris-HCl, 2 mM of MgSO4, 0.01% of Triton X-100, pH 8.8 (NEB), 0.2 µM of each primer (Microsynth), 0.1 mM of each dNT P and 0.06 U of Taq polymerase (NEB). PCR conditions comprised initial denaturation of 2 min at 96°C, followed by 35 cycles of denaturation for 30 s at 96°C, annealing for 45 s at 57°C and elongation for 45 s at 72°C, with a final extension step of 5 min at 72°C. Isolates collected in Boyaca, Santander, Norte de Santander and Cauca were processed at LBAA Z, following the conditions described previously but using Invitrogen supplies. In both cases, PCR products were visualized with UV on agarose gels. In order to determine the AG from negative isolates in the amplification with the AG -3 specific primers, the ITS - rDNA region from these isolates and also from the few positive controls were amplified using universal primers ITS 5 (5'~GGAAGTAAAAGT CGTAA CAAGG ~3') and ITS 4 (5'~TCCTCCGCTTATTGATATG C~3') (White et al., 1990). Isolates essayed at ETHZ were sequenced using the facilities of the Genetic Diversity Center (GDC) of this institute, while those processed in LBAA Z were sequenced at a commercial laboratory (Macrogen, Seoul). Sequencing reactions were prepared using a BigDye™ v3.0 Cycle Sequencing Kit (Applied Biosystems®, Foster City, CA). Sequencing reactions were run on an ABI Prism® 3100 genetic analyzer. Sequences were visualized and edited using the program Sequencher 4.0.5 (Gene Codes Corporation, Ann Arbor, MI ). The PCR products sent to Macrogen were sequenced in an ABI Prism® 3730 genetic analyzer and were manually edited using the software ChromasPro 1.5 for Windows (Technelysium Pty. Ltd, Tewantin, Australia). All the sequences were analyzed with BLAST®(Altschul et al., 1997) against the NCBI sequence database (National Center for Biotechnology Information, GenBank) to detect similar sequences of known AG s. Sequence data of the individuals tested were imported and assembled using BioEdit 5.0.9 (Ibis Biosciences, Carlsbad, CA) (Hall, 1999). Three sequences of R. solani AG-3 from GenBank (EF370434, AB19015 and AB19021) were used as references. Nucleotide identity among sequences was determined for each anastomosis group identified. Microscopic somatic compatibility reactions were determined with tests using 60 isolates collected in our study and identified as AG -3PT by ITS -rDNA sequencing. Tester isolates belonging to AG -2-1 and AG -3 were used to confirm the AG identity of the isolates essayed. Pairings were made on slides containing a thin layer of water agar (WA Oxoid) and the interaction was evaluated under a light microscope (Carl Zeiss  Axiostar plus), using safranin O staining (Bandoni, 1979). The hyphal anastomosis categories evaluated were those defined previously (Carling, 1996). We observed 15 optical fields and determined the number of fields in each reaction category (C0, C1, C2 and C3), determining the fusion frequency as%FF = (A*100)/B, where A is the sum of fusion points (in C1, C2 and C3 categories) in the 15 microscopic fields and B is the sum of contact points in the 15 microscopic fields (including the four categories) (Sneh et al., 1998). A set of 21 AG -3PT isolates was tested for macroscopic hyphal interactions to determine the somatic compatibility among isolates collected from different locations. Plates containing PDA were inoculated with disks of colonized PDA removed from the edge of an actively growing colony from the tested isolates and located three cm apart from each other. The 21 isolates were tested in all the possible combinations. Plates were incubated at 15oC and were evaluated after 21 d. The macroscopic somatic reactions were defined as merge and tuft according to defined categories (MacNish et al., 1997). Three isolates of each AG were randomly chosen for the pathogenicity test. Prior to inoculation, each isolate was grown for 48 h on PDA. Eleven plants species were tested as potential hosts: (i) seedlings of carrot (Daucus carota L.), bean (Phaseolus vulgaris L.), corn (Zea mays L.), tomato (Solanum lycopersicum L.), lulo (Solanum quitoense Lam. ), pea (Pisum sativum L.), ryegrass (Poa pratensis L.), and some weeds commonly found in potato fields (Raphanus raphanistrum L. and Brassica campestris subsp. rapa (L.) Hook. ); (ii) grass plantlets (Pennisetum clandestinum Hoechst Ex Chiov.) rooted in peat. Potato sprouts (Solanum tuberosum L. - cv. Capiro) rooting in peat were used as susceptible host plants. Seedlings were transferred to pots containing autoclaved quartz sand 5 d before inoculation. Each plant was inoculated with a 5 mm PDA plug taken from the margins of the fungal colonies (Carling and Leiner, 1986). The mycelial plug was located at one centimeter from the stem and was covered with quartz sand to prevent desiccation. Plants were transferred to a growth chamber and incubated at 20°C/12 h-photoperiod, watered with distilled water every two days and fertilized with nutrient solution (Murashige and Skoog, 1962) once a week. Fifteen days after inoculation, symptoms on the stems and roots were evaluated. In order to characterize differences in aggressiveness among the isolates, two categories of symptoms were considered: (i) on the stems, the symptoms were classified as small superficial lesions (SS L = mild symptoms with lesions size < 5 mm), large superficial lesions (LSL = lesions > 5 mm), or cankers (C); (ii) on the roots, we determined disease incidence, and lesion categories were characterized as on the stems. Symptomatic and non-symptomatic plant tissue was transferred to selective media to check for the presence of the fungus in the tested plants. Of a total of 433 isolates of R. solani collected from symptomatic plants in Cundinamarca, Nariño, Antioquia, Boyaca, Santander and Norte de Santander (Tab.2), 379 were positive for the AG -3 specific PCR essay (Lees et al., 2002). AG -3 identification based on positive specific PCR amplifications was confirmed by sequencing the ITS -rDNA region from several isolates. In addition, four R. solani isolates for which specific PCR amplification failed were classified as AG -3 based on their ITS -rDNA sequence. The sequence of the ITS -rDNA of these four isolates showed a mutation point on nucleotide number nine into the forward primer, which can explain its failure to amplify, these false negatives represent 1% of the evaluated isolates. The ITS 1 - ITS 2 regions of the rDNA from the R. solani sequences in this study showed high sequence similarity (98.3-100%) among themselves and with three AG -3PT sequences from GenBank. Thus, by the criteria of amplifying with specific PCR primers plus sequencing of the rDNA , 88.45% of the isolates were identified as AG -3. A few isolates were identified as AG -2-1 (2.54%) or binucleate Rhizoctonia (AG-A, AG-E and AG -I) (6.24%). Around 3% of the isolates could not be assigned to any anastomosis group, due to poor sequence quality (Tab.1). Of the 433 isolates analyzed, 374 were isolated from stem cankers and 59 from sclerotia on mother tubers. 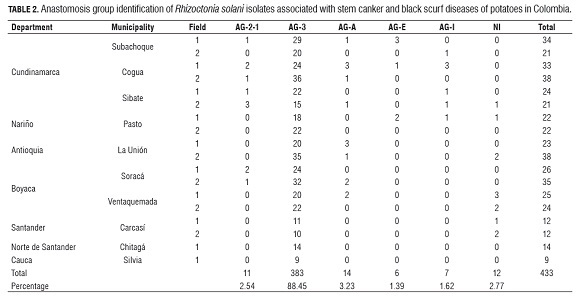 Fifty-five tuber-borne sclerotial isolates were identified as AG -3, two as AG -2-1 and two as AG -A and AG -E each. Microscopic somatic interactions between the AG -3PT tester and a sample of 60 isolates randomly taken from the collection of R. solani isolates resulted in positive anastomosis reactions (frequency of hyphal fusion higher than 50%), confirming the classification of isolates based on their ITS -rDNA sequences. Hyphal fusion frequency between isolates belonging to AG -3 varied from 40 to 95%. A high proportion of isolates had frequencies between 45 and 70%, suggesting heterogeneity among individuals. We were not able to distinguish between hyphal perfect fusion (C3) and killing reactions (C2) with microscopic level observations. In the macroscopic somatic essay, the formation of tufts was common (91.4% of isolates pairs evaluated). This was evidence of somatic incompatibility among isolates and only 8.6% of the pairs tested presented merge reactions (perfect fusion). Macroscopic interactions did not reproduce the observed categories of microscopic interactions. In fact, there was a continuum of somatic compatibility to incompatibility (Fig.2). Symptoms observed on the different hosts correspond to typical reported stem canker symptoms (Carling and Leiner, 1986; Carling and Leiner, 1990; Carling et al., 2001), although severity varied between AG s (Tab.3). Pathogenicity was determined qualitatively and by the estimate of lesion size on the stems and roots. In some cases, isolates showed a distinct host range. Isolates of R. solani AG -3PT significantly affected the stems of solanaceous hosts such as potato, tomato and lulo causing large cankers (>5 mm). No symptoms were observed on the roots of these plants. Although AG -3PT isolates caused very abundant small lesions on the roots of pea, bean, corn and carrot plants, they did not cause lesions on the stems. The other plants inoculated with AG-3PT (B. campestris subsp. rapa, R. raphanistrumi, P. clandestinum and P. pratensis) did not express symptoms. Besides affecting potatoes, isolates of R. solani AG -2-1 attacked the stems of lulo and Brassicaceae hosts (R.raphanistrum and B. campestris subsp. rapa),causing cankers from 0.4 to 10.0 mm, but not on the roots. However, these isolates produced small spots on a large proportion of pea, bean, corn and carrot roots. The two grasses evaluated (P. clandestinum and P. pratensis) did not show symptoms when inoculated with AG -2-1 or AG -3PT. The fungus was recovered from all the evaluated plants (symptomatic and non symptomatic). Stem and root lesions were categorized as follows: NI (non-infected); SS L (superficial small lesion) and C (canker). Size of the lesions is the average of 5 plants. The data correspond to the range of symptoms in five inoculated plants for each AG tested. For example, in the same set of plants, we found non-infected plants and plants with cankers (NI /C) Symptoms caused by binucleate Rhizoctonia strains (AG - A, AG -E and AG -I) were characterized by the presence of many small superficial lesions on the roots in all plant species evaluated except for R. raphanistrumi and B. campestris subsp. rapa. The stems of the other plants were not affected by any of the binucleate strains tested. This is the first large scale population study carried out in Colombia aimed at determining the composition of AG s associated with Rhizoctonia diseases of potatoes and at assessing the effect of the various AG s on symptom expression in different hosts. Previous reports indicated that R. solani AG -3 is the most frequent AG associated with stem canker of potatoes worldwide (Carling and Leiner, 1990; Banville and Carling, 2001; Tsror, 2010). 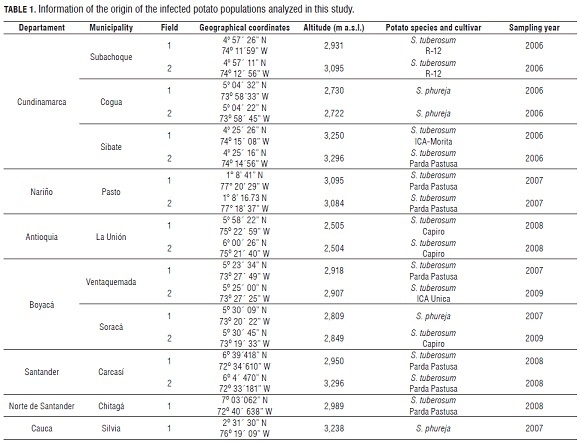 Our results indicated that the Colombian population of R. solani was not an exception as the largest proportion of the potato-infecting isolates were identified as AG -3, based on specific PCR essay, sequencing of the ITS -rDNA region and confirmed by anastomosis grouping. The two most efficient and accurate methodologies to assign isolates to AG s were the specific PCR essay and ITS -rDNA sequencing. Correlation between microscopic killing anastomosis (C2 reaction) and perfect fusion (C3 reaction) with the corresponding macroscopic somatic interactions 'tuft' and 'merge' has been demonstrated for AG -8 (MacNish et al., 1997) and for R. solani AG -3PT and TB from potatoes and tobacco (Ceresini et al., 2002). However, the macroscopic somatic interactions were not good predictors for the microscopic anastomosis reactions between isolates of the soybean-infecting pathogen R. solani AG -1 IA (Campos and Ceresini, 2006). Particularly in our study, because we were not able to easily distinguish between perfect fusion and killing anastomosis reaction at microscopic level, we could not establish a correlation between microscopic and macroscopic interactions between isolates of R. solani AG -3PT. Consequently, we took the macroscopic interactions as the sole predictor of somatic incompatibility. The macroscopic interactions indicated the predominance of somatic incompatibility among R. solani isolates. We also observed that macroscopic interaction phenotypes among isolates varied in intensity. For example, some pairings showed a strong "barrage"-type somatic incompatibility reaction in the line of contact among isolates, which was characterized by a high amount of aerial mycelia (tuft) (Fig.2a, b). In contrast, some pairings showed a light but well defined somatic incompatibility reaction. Around 91% of the pairings were somatically incompatible, indicating a high level of genetic diversity among the isolates, at least for the genes related with somatic compatibility. Nine percent of the pairings were somatically compatible, characterized by a "merge"-type interaction. Most of the somatically compatible pairings occurred between isolates from the same county, except for one isolate from Pasto1 which was somatically compatible with five isolates, each one with a different geographical origin. R. solani AG -3PT was the principal and most aggressive pathogen associated with potatoes in Colombia. The prevalence of AG -3PT of potatoes in Colombia is in accordance with previous worldwide reports (Anguiz and Martin, 1989; Carling et al., 1989; Bains and Bisht, 1995; Balali et al., 1995; Virgen-Calleros et al., 2000; Campion et al., 2003; Truter and Wehner, 2004; Woodhall et al., 2007; Woodhall et al., 2008; Tsror, 2010; Cedeño et al., 2001). R. solani AG -2-1 was also detected on stem cankers, but at a much lower frequency and causing only mild symptoms of potatoes. AG -2-1 was detected exclusively in Boyaca and Cundinamarca. The restricted occurrence of AG -2-1 in Boyaca and Cundinamarca may be attributed to the abundance of two Brassicaceae weed species (R. raphanistrumi and B. campestris subsp. rapa) (Arrieta, 2000), which are invasive of potato fields and hosts to the pathogen. In fact, AG -2-1 has been reported as a principal Brassica pathogen (Carling and Leiner, 1986). The fact that distinct R. solani AG s can be associated with potato stem canker in the same field in Colombia is particularly important for defining disease management strategies effective against all AG s, as their response to a particular strategy can vary (Campion et al., 2003). Any attempt for officially labeling fungicides for potato crops should consider the complex etiology of the stem canker disease. We failed to detect the occurrence of AG -4, -5, -7 and -8 in Colombian potato fields despite the fact that their occurrence has been previously reported for potatoes elsewhere in the world (Anguiz and Martin, 1989; Bains and Bisht, 1995; Balali et al., 1995; Virgen-Calleros et al., 2000; Cedeño et al., 2001; Campion et al., 2003; Truter and Wehner, 2004; Rosa et al., 2005; Woodhall et al., 2007; Silva-Barreto et al., 2010; Tsror, 2010). The association of different AG s of R. solani with underground diseases in invasive plants has been established in potato fields (Silva-Barreto et al., 2010). Besides environmental factors, the distinctively variable geographical distribution of host plants (such as cultivated, invasive weeds or wild plant species) are probably the most important selection factors determining the occurrence and prevalence of distinct AG s in potato fields. Because crop rotation is one of the main strategies for controlling stem canker and black scurf diseases of potatoes, disease management strategies based on crop rotation must consider the odds of the emergence of a new pathogen of potatoes, especially when the rotation of the crop is susceptible to other Rhizoctonia-like pathogens. Although many R. solani AG s are considered host specific, even the host specialized ones have shown some level of damage in hosts distinct from their original host (Anderson and Stretton, 1982; Ogoshi, 1987). Our results indicated that R. solani AG -3 is able to infect different plant species. Potatoes, tomatoes and lulo exhibited stem cankers while peas, beans, corn and carrot showed root infection. Despite the lower disease severity levels and organ specificity on other hosts, these plants may contribute to the fungal inoculum build up in the soil. Therefore, the ability of other host plants to harbor AG -3PT or AG -2-1 is another relevant factor underlying the adoption of a crop rotation system. The adoption of a crop rotation system should consider non-host plant species for the pathogens, such as ryegrass, which was not affected by AG -2-1 or AG -3PT, although the fungal inoculum remained viable on plant debris. Binucleate Rhizoctonia species (AG -A, AG -E and AG -I) were also associated with stem canker lesions. These binucleate Rhizoctonia appear to have a wide ecological role. Some non-pathogenic Rhizoctonia have a role as a biological control agent causing only a mild infection in plants, which triggers defense responses against pathogenic Rhizoctonia (Carling and Leiner, 1986; Poromarto et al., 1998). Other binucleate Rhizoctonia can cause very destructive diseases, such as damping off (Martin, 1988; Escande and Echandi, 1991; Demirci et al., 2002). The binucleate Rhizoctonia associated with potatoes in Colombia were only mildly pathogenic as symptoms were restricted to the stem surface and no cankers were observed. These strains could be potentially exploited as bio-control agents, although an in-depth study of their ecological role is warranted. Finally, our research pointed towards the need to evaluate the variation in the reaction of potato germplasm to develop management strategies based on disease resistance. Specific PCR-based methods or DNA sequencing of the ITS -rDNA were useful for detection and identification of AGs. R. solani AG -2-1 and AG -3PT were the only two AG s associated with potato stem canker and black scurf diseases in Colombia. AG -3PT was the principal stem canker and black scurf associated pathogen on potatoes. AG -2-1 and AG -3PT were able to infect other host plants such as tomatoes, lulo, beans, carrot and peas. AG -2-1, particularly, was pathogenic to Brassicacea plant species. The adoption of a crop rotation system should consider non-hosts of AG -2-1 and AG -3PT. This research was supported by the Universidad Nacional de Colombia, Ministerio de Agricultura y Desarrollo Rural de Colombia and Asociación Hortifrutícola de Colombia (Asohofrucol), and partially funded by an ETH Zurich (Swiss Federal Institute of Technology, Zurich, Switzerland) grant (TH-16/06) to P. C. Ceresini. Sequence data were collected using the facilities of the Genetic Diversity Center at the ETH Zurich. The primary author wants to thank Dr. Enrique Torres (Emeritus Professor, Universidad Nacional de Colombia) for his review of the manuscript. We also thank Marcello Zala (ETH Zurich) for his technical assistance. P. C. Ceresini is a Research Fellow (Pq-2 308394 / 2009-7) from CNPq (Conselho Nacional de Desenvolvimento Cientifico e Tecnologico, Brazil).